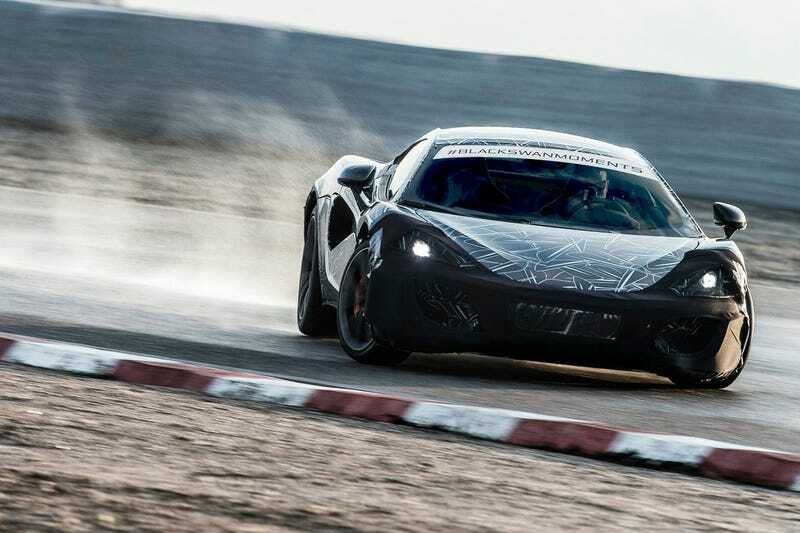 British supercar/hypercar manufacturer McLaren has released a third teaser image of its upcoming Sports Series, this time showing the full car in full drift mode on a racetrack. Although the image does show the full car, rather than just the doors or front end, most of it is still covered in a fair bit of camouflage. We can see from the shape of the Sports Series prototype shown here, though, that it will carry many of the design cues from McLaren's 650S and P1. Likewise, the carbon fiber tub chassis is shared with the 650S, and the 3.8-liter V8 is the same one used in both of McLaren's current cars, too. Reports suggest an output of around 450 horsepower, but no technical details have been confirmed at the time of writing. The Sports Series is expected to launch next year with a price tag north of $210,000. Stay tuned.